Caminibacter mediatlanticus strain TB-2T , is a thermophilic, anaerobic, chemolithoautotrophic bacterium, isolated from the walls of an active deep-sea hydrothermal vent chimney on the Mid-Atlantic Ridge and the type strain of the species. C. mediatlanticus is a Gram-negative member of the Epsilonproteobacteria (order Nautiliales) that grows chemolithoautotrophically with H2 as the energy source and CO2 as the carbon source. Nitrate or sulfur is used as the terminal electron acceptor, with resulting production of ammonium and hydrogen sulfide, respectively. In view of the widespread distribution, importance and physiological characteristics of thermophilic Epsilonproteobacteria in deep-sea geothermal environments, it is likely that these organisms provide a relevant contribution to both primary productivity and the biogeochemical cycling of carbon, nitrogen and sulfur at hydrothermal vents. Here we report the main features of the genome of C. mediatlanticus strain TB-2T. Caminibacter mediatlanticus type strain TB-2T (=DSM 16658T=JCM 12641T) is an epsilonproteobaterium isolated from the walls of an active deep-sea hydrothermal vent on the Mid-Atlantic Ridge . C. mediatlanticus is part of the recently proposed order Nautiliales , which comprises three genera: Nautilia, Caminibacter and Lebetimonas. All Nautiliales cultured are thermophilic chemolithoautotrophs and have been isolated from deep-sea hydrothermal vents. The genus Caminibacter includes three described species: C. hydrogeniphilus, the type strain for this genus , C. profundus , and C. mediatlanticus . All three Caminibacter species are thermophilic (55- 60 °C) and conserve energy by coupling the oxidation of hydrogen to the reduction of nitrate and sulfur. C. profundus can also grow microaerobically (0.5% O2) . The genus Nautilia includes four species: N. lithotrophica , N. profundicola, whose genome was recently sequenced [5,6], N. abyssi  and N. nitratireducens . While all Nautilia spp. couple hydrogen oxidation to sulfur reduction, N. nitratireducens can also use nitrate, thiosulfate and selenate as terminal electron acceptors . The genus Lebetimonas includes a single species, L. acidiphila, a sulfur-respiring chemolithoautotroph . Here we present a summary of the features of C. mediatlanticus strain TB-2T and a description of its genome. C. mediatlanticus strain TB-2T was isolated from the Rainbow vent field on the Mid-Atlantic Ridge (36° 14’ N, 33° 541 W). Caminibacter sp. strain TB-1 , C. profundus and C. hydrogeniphilus are the closest relatives to C. mediatlanticus, with a 16S rRNA gene similarity of 99%, 96.3% and 95.9%, respectively. The phylogenetic position of C. mediatlanticus relative to all the known type strains of Epsilonproteobacteria isolated from deep-sea hydrothermal vents is shown in Figure 1. 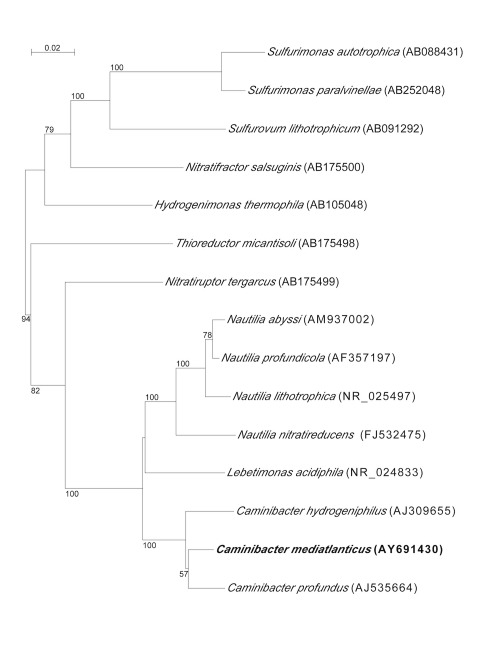 Phylogenetic position of Caminibacter mediatlanticus strain TB-2T relative to type strains of Epsilonproteobacteria isolated from deep-sea hydrothermal vents. Sequences were aligned automatically using CLUSTAL X and the alignment was manually refined using SEAVIEW [10,11]. Neighbor-joining trees were constructed with Phylo_Win, using the Jukes-Cantor correction . Bootstrap values (>50%) based on 500 replications. Bar, 0.02 substitutions per nucleotide position. The cells of C. mediatlanticus are Gram-negative rods of approximately 1.5 x 0.75 µm, motile by mean of one to three polar flagella (Figure 2 and Table 1). On solid media, the cells form small brownish colonies. Growth occurs between 45 and 70˚C, 10 and 40 g NaCl L-1 and pH 4.5 and 7.5. Optimal growth conditions are 55˚C, 30 g NaCl l-1 and pH 5.5 (generation time 50 min). Growth occurs under strictly anaerobic, chemolithoautotrophic conditions in the presence of H2 and CO2 with nitrate or sulfur as electron acceptors and the formation of ammonia or hydrogen sulfide, respectively. Oxygen, selenate, arsenate, thiosulfate and sulfite are not used as terminal electron acceptors. No chemoorganoheterotrophic growth has been reported. Evidence that C. mediatlanticus fixes CO2 via the reductive tricarboxylic acid (rTCA) cycle was obtained by the detection, by PCR, of the gene encoding for the ATP citrate lyase, a key enzyme of the cycle, and by the determination of the specific activities of the rTCA enzymes . The genomic G + C content of C. mediatlanticus is 27.13 mol%. 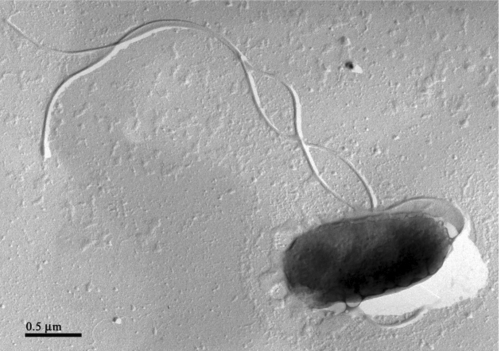 Electron micrograph of a platinum shadowed cell of Caminibacter mediatlanticus strain TB-2 T showing multiple flagella. Bar, 0.5 μm. Evidence codes - TAS: Traceable Author Statement (i.e., a direct report exists in the literature); NAS: Non-traceable Author Statement (i.e., not directly observed for the living, isolated sample, but based on a generally accepted property for the species, or anecdotal evidence). These evidence codes are from the Gene Ontology project . If the evidence code is IDA, then the property was directly observed, for the purpose of this specific publication, for a live isolate by one of the authors, or an expert or reputable institution mentioned in the acknowledgements. None of the classical chemotaxonomic features (peptidoglycan structure, cell wall sugars, cellular fatty acid profile, respiratory quinones, or polar lipids) are known for C. mediatlanticus strain TB-2T. The genome of C. mediatlanticus strain TB-2T was selected for sequencing in 2005, during phase two of the Microbial Genome Sequencing Project of the Gordon and Betty Moore Foundation, and it was sequenced at the J. Craig Venter Institute. It was the first genome of an Epsilonproteobacterium from deep-sea hydrothermal vents to be sequenced. C. mediatlanticus was selected because it is a thermophilic member of the Epsilonproteobacteria, which, as a group, represent a significant fraction of the chemosynthetic communities inhabiting the deep-sea hydrothermal vents [20, 21]and because of its ability to fix CO2 under strictly anaerobic conditions . The draft genome sequence was completed in November 2006 and presented for public access on June 19, 2007. The NCBI accession number is ABCJ00000000.1 and consists of 35 contigs (ABCJ01000001-ABCJ01000035). Table 2 shows the project information and its association with MIGS version 2.0 compliance . C. mediatlanticus was grown in modified SME medium at 55°C under a H2/CO2 gas phase (80:20; 200 kPa) with CO2 as the carbon source and nitrate as the electron acceptor, as described by Voordeckers et al. . Genomic DNA was isolated from 1–1.5 g of pelleted cells using an extraction protocol that involved a phenol:chloroform:isoamyl alcohol(50:49:1) step followed by isopropanol precipitation, as described by Vetriani et al. .
Two genomic libraries with insert sizes of 4 and 40 kbp were constructed from the genomic DNA of C. mediatlanticus as described in Goldberg et al. . The resulting plasmid and fosmid clones were sequenced at the J. Craig Venter Institute from both ends to provide paired-end reads and an 8× coverage. The Celera assembler was used to generate contigs and reconstruct the draft genome . The genome sequence was analyzed using the Joint Genome Institute IMG system , the RAST (Rapid Annotation using Subsystem Technology) server , the GenDB annotation program  at the Center for Genome Research and Biocomputing at Oregon State University, and the NCBI Prokaryotic Genomes Automatic Annotation Pipeline. The annotation of the draft genome was done using the Prokaryotic Genomes Automatic Annotation Pipeline of the National Center for Biotechnology Information . The PGAAP combines HMM-based gene prediction methods with a sequence similarity-based approach, and compares the predicted gene products to the non-redundant protein database, Entrez Protein Clusters, the Conserved Domain Database, and the COGs (Clusters of Orthologous Groups). Gene predictions were obtained using a combination of GeneMark and Glimmer [30-32]. Ribosomal RNAs were predicted by sequence similarity, using BLAST against the non-redundant nucleotide database and/or using Infernal and Rfam models. The tRNAscan-SE  was used to find tRNA genes. The predicted CDS were then searched using the NCBI nonredundant protein database. The predicted protein set and major metabolic pathways of TB-2T were searched using the KEGG, SwissProt, COG, Pfam, and InterPro protein databases implemented in the IMG and GenDB systems. Additional gene prediction analysis and manual functional annotation was performed within the IMG and using the Artemis software (release 13.0, Sanger Institute). The genome consists of a 1,663,618 bp long circular chromosome with a 27.13 mol% G + C content (Table 3). Of the 1,894 genes predicted, 1,826 were protein-coding genes. Of these, 1,180 were assigned to a putative function, while the remaining genes were annotated as coding for hypothetical proteins. In the genome of C. mediatlanticus, 84 protein-coding genes belong to 38 paralogous families, corresponding to a gene content redundancy of 4.44%. The properties and the statistics of the genome are summarized in Table 3. The distribution of genes into Clusters of Orthologous Groups (COGs) functional categories is shown in Table 4. C. mediatlanticus strain TB-2T is an obligate anaerobic, hydrogen-dependent chemolithoautotroph. 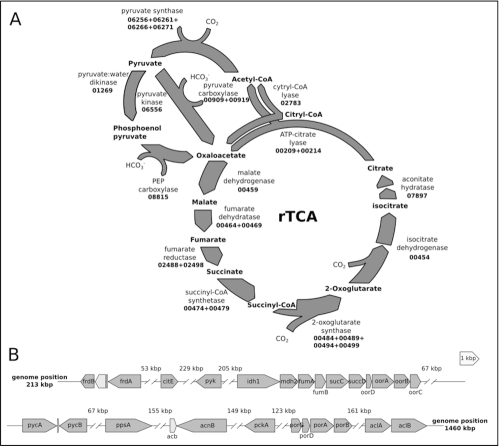 In this bacterium, CO2 fixation occurs via the reductive tricarboxylic acid (rTCA) cycle . By fixing CO2 in the absence of oxygen, C. mediatlanticus is completely independent from photosynthetic processes, and therefore this bacterium is a true primary producer in the deep ocean (in contrast to aerobic chemosynthetic bacteria, which ultimately depend on photosynthesis-derived oxygen for their energy metabolism). In Figure 3 we show a reconstruction of the rTCA cycle and the organization of the rTCA cycle-related genes in the genome of C. mediatlanticus. Reconstruction of the rTCA cycle and related gene clusters in C. mediatlanticus strain TB-2T. A) rTCA cycle. Enzymes are identified by the corresponding gene locus in the C. mediatlanticus genome (CMTB2_gene number). B) Structure of the gene clusters encoding for enzymes involved in rTCA cycle. ORF present within the same clusters are shown in light gray. The distance between clusters is reported in thousands of base pairs (kbp). Genes are oriented according to their direction and drawn to scale. frdBA: fumarate reductase; citE: citril-CoA lyase; pyk: pyruvate kinase; idh1: monomeric isocitrate dehydrogenase; mdh2: malate dehydrogenase; fumAB: fumarate hydratase; sucCD: succinyl-CoA synthetase; oorDABC: 2-oxoglutarate ferredoxin synthase; pycAB: pyruvate carboxylase; ppsA: pyruvate water dikinase; acb: bifunctional aconitate hydratase/methyl isocitrate dehydratase; acnB: aconitate hydratase; pckA: phosphoenol pyruvate carboxy kinase; porGDAB: pyruvate ferredoxinoxido reductase/synthase; aclBA: ATP-citrate lyase. We thank the Gordon and Betty Moore Foundation for supporting the C. mediatlanticus genome sequencing project, and the technical team at the J. Craig Venter Institute. Work on C. mediatlanticus was supported, entirely or in part, by NSF Grants MCB 04-56676, OCE 03-27353, MCB 08-43678 and OCE 09-37371 to CV, and by the New Jersey Agricultural Experiment Station. Garrity GM, Bell JA, Lilburn T. Class V. Epsilonproteobacteria class. nov. In: Garrity GM, Brenner DJ, Krieg NR, Staley JT (eds), Bergey's Manual of Systematic Bacteriology, Second Edition, Volume 2, Part C, Springer, New York, 2005, p. 1145.